A couple years ago I bought both kids knitting spools because I thought they were cute and I had happy memories of the monotonous craft. I hauled them out last week when the kids were feeling better and Tomas was definitely not feeling better. This silly craft provided many minutes of quiet time for this Momma to tend to the mundane tasks of dishes, laundry, and vacuuming that were in dire need of doing once I was better. The only part I haven’t quite figured out is a clean cast off, but no one’s complained this far. Now I’ll need to do a bit of thinking to figure out what to do with these long tubes of yarn! Hats? Coasters? Trivets? All this felt sure has gone a long way these past few days, and there’s still a bunch left over for more crafty goodness. Not bad for under $5! 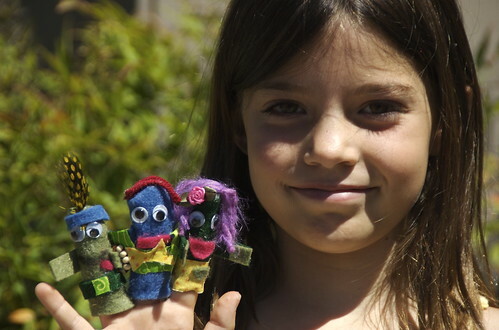 On Saturday morning Maggie asked if she could make finger puppets. This was so easy, I couldn’t say no (and I do say no pretty often, I have to if I want to keep my sanity, or have a few minutes of nothingness). We measured her index finger and I cut out a whole-lotta felt squares to be folded in half and sewn along the top and length — leaving the bottom open. Once stitched we turned the puppets inside out so to hide the seams. Next up, I dumped a pile of fabric scraps and random adornments including googly eyes, feathers, yarn and pretty flowers. I then handed her the fabric glue and let her have at it. It was a glorious mess and a wonderful (quiet) frenzy of creative activity that lasted at least an hour. Bjorn watched from the sidelines for a while and finally stepped in to make his own. When he got bored (tired?) of sewing his bodies, I took over so he could get to the fun part — decorating! On Sunday they literally spent hours making up stories and creating their cardboard stage and sets. And in the afternoon we had family theater time to view their 1/2 planned, 1/2 improv productions. Lets just say they both had a lot of blood and gore (I might have to have a talk with them about that!). While Maggie was busy at work on her mouse, Bjørn came up to me to ask if he could make something as well. Like I would say no?! 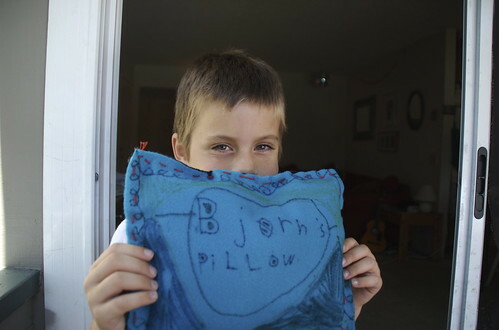 He very carefully chose his colored felt (black and teal) and embroidery thread (red), and just before starting to sew, he asked if he could also decorate his pillow. Of course! So I handed him the fabric markers. When he was all done he gave me this huge smile and announced that sewing was a lot easier now that he was older. He remembered struggling over a sewing project in school when he was a kinder, and was very relieved that it wasn’t as difficult as back then. I have to say, I’m quite impressed with how even his stitching is! Maggie decided that she wanted to institute Project Days this summer. Her idea was to have specified days completely devoted to crafting. I don’t think it’s possible for me to convey with any accuracy just how nervous this made me — one or two crafts I can handle. An entire day of back-to-back forced creativity overwhelms me. So, I handed her a pile of craft and sewing books and told her to make a list of the sorts of things she’d like to try out. Nothing like postponing a craft-athon to ease one into it. She quickly thumbed through my books and claimed that she’d read ’em all and knew exactly what she wanted to do. 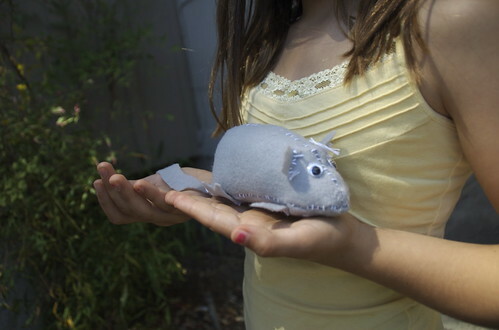 She then sketched the pattern above to show me how she wanted to make a mouse. 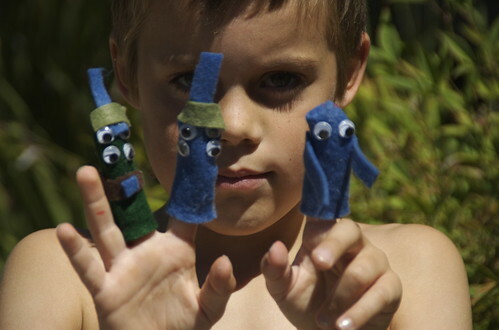 After my morning coffee we all packed into the car and headed for the craft store to get felt and stuffing. The minute she got in the door she set to work and barely had need of any help from me. Francis now has a brightly decorated tail, a mousy home complete with confetti bedding, and a lovely pair of earrings. Mamie has been my girl’s favorite doll from the moment she came into our house. 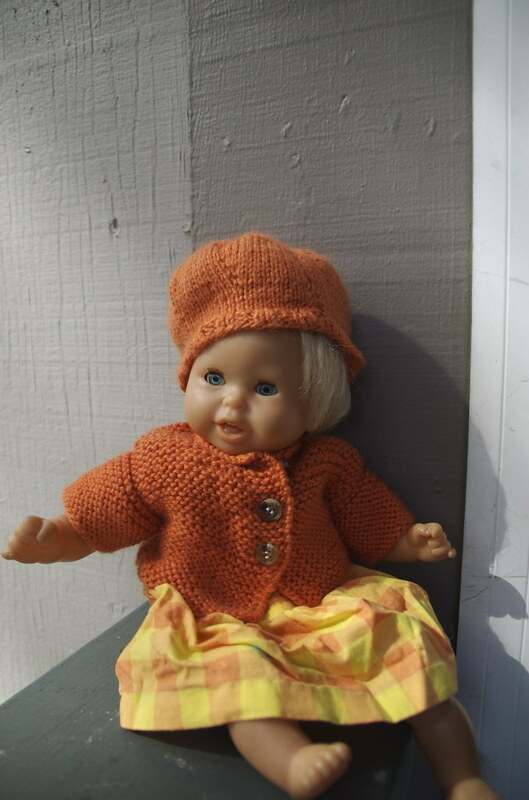 She is a Corolle doll — a very special gift from my mom when Miss M was just a wee one herself. Mamie is also a very fashion-conscious doll, and has the most amazing wardrobe. A cousin of mine in France sews and knits incredible outfits for this young lady. Every time my mom comes to visit, she brings a few more outfits.